Plaintiff, a 65-year old cooling tower engineer, suffered multiple life-threatening injuries when he fell from the top of a cooling tower as a result of a defective railing. The railing defect was the result of several years of abject neglect on the part of the property owner. Our client owned and operated a cooling tower design, construction and maintenance company which serviced facilities throughout the country. One of his clients was an institution in eastern Massachusetts which operated approximately ten cooling towers located in two central locations. On the date of the incident he was asked by the utility operations personnel at the facility to check on an overflow situation at the top of one of the cooling towers. The tower in question was approximately 25 years old. Fall protection at the top of the tower was provided by an OSHA-compliant metal railing. The railing was steel and the connectors at the mid-rail and top rail were made from aluminum. 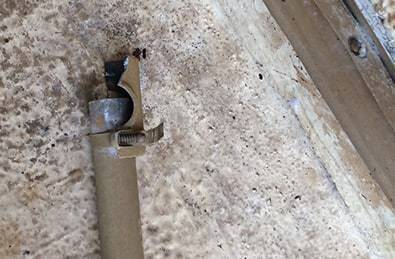 With the exception of two connectors, no repair or replacement had been conducted on the railing since its installation. The railing was so decrepit that over twenty of the thirty-five railing connectors were cracked or broken. Some were held together with tape. Another was held together with a radiator hose clamp. The incident occurred when the plaintiff got on his knees to peek through the railing to assess the leakage. He leaned part of his body weight on the mid-rail, which immediately gave way; the connector with the hose clamp had fractured. He fell approximately 30 feet to the concrete rooftop below. The plaintiff was rushed to Massachusetts General Hospital where he spent the next six weeks in the intensive care unit. He had suffered multiple injuries, including skull fractures, intracranial bleeding, multiple leg fractures, and multiple hand and shoulder fractures. He also sustained a number of internal injuries. He underwent multiple surgical procedures, including operations to address the brain injury and bleeding, as well as to repair fractures and to close extensive skin wounds. Broken fixture held by hose clamp. Plaintiff was transferred first to Spaulding Rehabilitation Hospital for approximately four weeks of in-patient treatment, then to outpatient treatment near his home. Treatment was intensive for the next year and continues even after three years. Plaintiff has undergone additional surgeries for hand and shoulder injuries. Plaintiff returned to part-time work within a year of the incident, but his work capacity has been limited by his traumatic brain injury which affects him cognitively and physically. Plaintiff also suffers from permanent hearing loss in one ear, as well as a loss of sense of smell and taste. He is also impaired by his orthopedic injuries. The injuries were documented by a neurologist, a neuropsychologist, and an orthopedic surgeon. Claims were also brought for the plaintiff’s wife, who suffered a significant loss of her husband’s consortium. Their relationship has been burdened by his injuries and disability since the date of the accident. 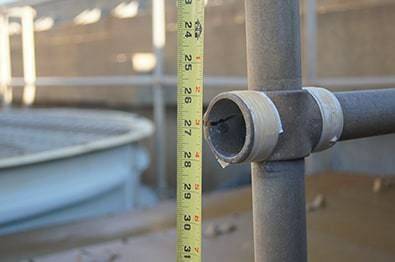 Discovery revealed that no person at the institution, including the utility department which ran the cooling facilities, or the in-house safety department responsible for institution-wide safety assessments, had ever bothered to inspect the failing railing system. The utility department had no preventive maintenance program for inspection of the railings or other safety systems. The safety officer had never even inspected any of the rooftop cooling facilities, despite his specific job description calling for periodic assessments of the facilities. The safety department had no system in place to proactively ensure compliance with building codes or workplace safety regulations. The matter was settled at mediation after two years of discovery confirmed the defendant’s failure to provide any inspection, maintenance or repair of the railing. The defendant has attempted to shift the blame to plaintiff’s cooling tower company, and is still pursuing its extremely weak indemnity claim. As of the time of the settlement of the bodily injury claims, the defendant had failed to point to anything other than conjecture and surmise in support of its allegations. Plaintiff was covered by workers’ compensation for lost earnings and medical benefits. The worker’s compensation lien was deeply compromised. This case was handled by attorney David W. White, who has over thirty years of handing premises liability, construction accident, and other personal injury cases.